Here at JMC Automotive Equipment we focus our efforts on making sure you have the right information before you go out and select important pieces of equipment for your garage or shop. That is why this week we have prepared an informational piece that will allow you to be as knowledgeable as possible before purchasing one or more tire changers. 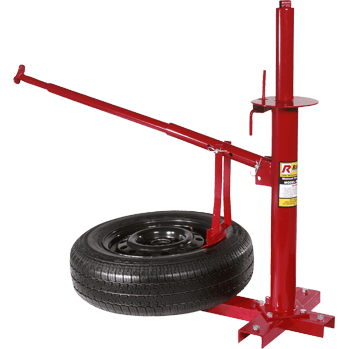 Tire changers are one of the most fundamental pieces of equipment any shop or garage owner can have and there are many accessories that you may need to consider when shopping for one. Roller or shovel-type bead separators, integrated tire inflation systems, air surge pulse for faster inflation speed and improved bead seating, low speed drive systems with increased torque for servicing tough combinations, and last but not least, leverless mounting/demounting. These are just specifications that may come with the tire changer but you must first keep in mind the type of vehicle that will be serviced. All of these added bells and whistles may come at an elevated cost so it is important to remember what is best for your shop/garage and your wallet. Long gone are the days of easy steel rims and regular valve stems. These days, many vehicles have “softer” aluminum rims, tires with stiff sidewalls and a tire pressure monitoring system (also known as TPMS) valve stems that if not serviced properly can easily break. Times are changing and so is the tire changing industry so make sure you keep our advice in mind if you’re a newbie shopping for a tire changer. 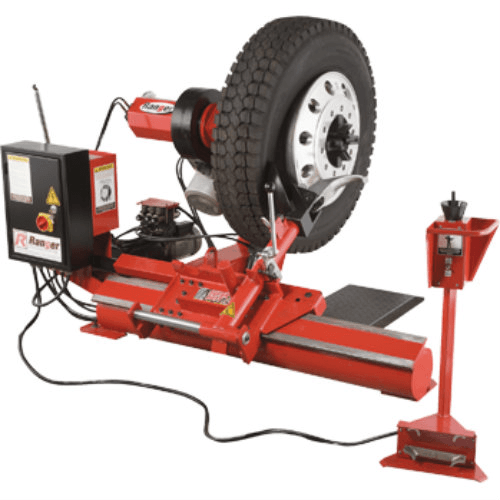 Leverless (also known as touchless) tire changers makes it easier to change a low profile, run flat tire on a 22” rim but these machines require a little training to use. But a little training is a small price to pay for all of the efficiency improvement and adaptability in the future. Leverless tire changers lift and set up heavy rims on their own and don’t require the operator frequently bending down. This all sounds good but not so fast, you need to know that these specs come at a cost. Touchless tire changers are currently top of the line and can be a pretty big investment. As you might already know, heavy duty tire changers require larger equipment due to the size of the vehicles they service. These tire changers can work with wheels up to 56 inches (142 cm) in diameter and tires up to 90.5 inches (229 cm) in diameter and 43 inches wide. They are used mainly for agricultural off-road and construction vehicles but there are now bigger versions designed to mount and dismount tires up to 95 inches and feature a hydraulically operated self-centering four jaw chuck with clamping jaws that can clamp 14 to 58 inches from either the wheel’s inside or from the center bore. Motorcycle tire changers aren’t as sophisticated as passenger cars, light truck or heavy duty tire changers mainly because the wheels they deal with are smaller and lighter. 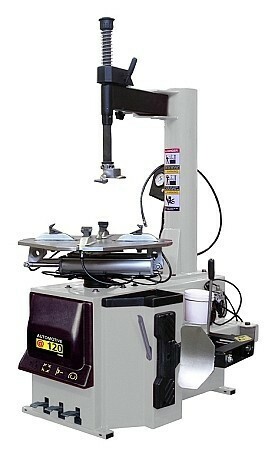 They provide a simple bead loosening system and rim clamps are powered manually. Many of them can also accommodate wheel diameters as small as 10” and wheels 1-1/2” wide. You can also service small atv wheels and tires as well. To put it simply, half the voltage is available to a 110V machine which means the amperage is doubled. Most technicians will use a machine with a capacity of 110V because it will prevent them from having to call the electrician as often but just because it saves you a visit from the electrician doesn’t mean it is the best option and it really all depends on usage. Accessories and features can sometimes either make or break a final decision because they can reduce the amount of time a technician spends on each tire and even the number of technicians needed to service them. Fuel economy as well as requirements in the past years and vehicle users looking more for large rims with low profile tires has greatly affected the kind of work fleets require. 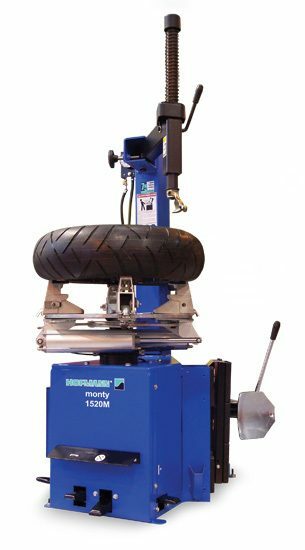 You will want a tire changer with a large turntable and tilt-mechanism in order to accommodate the types of tires out right now whilst being able to adapt to the larger and thinner tires as well. The best advice we can give you is study up on your specific requirements before you choose a machine that may or not be appropriate. We all know of the wide array of vehicles out right now and that they all have different tires as well as requirements for those tires. Electric vehicles for instance are being equipped with low rolling resistance tires which increase fuel efficiency (at a cost). These tires have stiffer sidewalls and are made of a harder rubber compound which makes them harder to change. Having tire changerswith power operated assist tools will prove to be quite helpful because they ensure that these low rolling resistance tires are serviced in the best way possible. 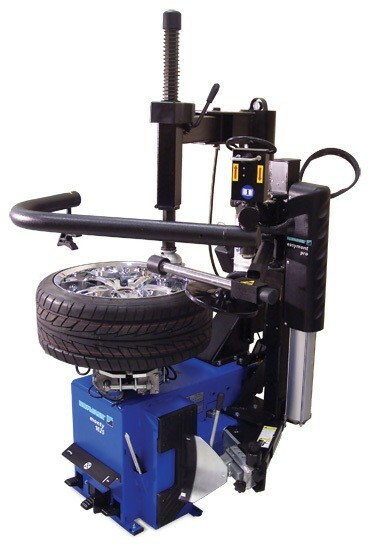 If you run a modern tire service department, having a tire changer with assist tools is pivotal because these machines have a bundle of devices which improve efficiency, safety and the damage to your high quality wheels will be minimal. Big fleets are not as picky with the care of their rims compared to regular consumers but it’s becoming increasingly necessary to have accessories to get more jobs done simultaneously. It all depends on the size of your shop, budget and what kind of vehicles you service on a regular basis. 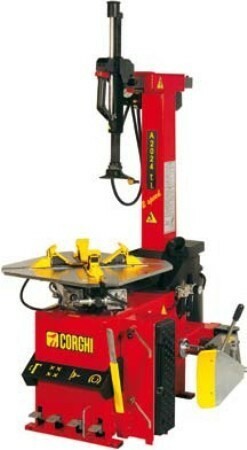 There are a few other things to keep in mind before purchasing a tire changer. One being many technicians are having trouble breaking beads on tires with the tire changer’s shovel. This problem will only increase as sidewalls become stiffer. Technicians blame the machine for this but it is possible that your shop’s air compressor isn’t potent enough. Your average tire changer requires that you have an air compressor capable of at least 150 psi. 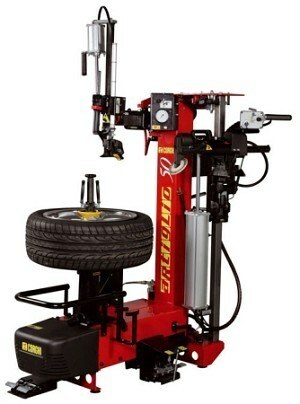 The tire changer you purchase for your garage or shop will need to be able to work on all of the vehicles you service but also keep in mind that you don’t want a primitive machine that will limit itself to just old vehicle types. We’re not saying you have to spend thousands of dollars but do think a little ahead. You also want to make sure that the warranty offered by the company you purchase from includes parts and labor on the machine as well as offer responsive technical service in between. If after reading this you’re still analyzing if a tire changer is worth spending money on, remember that purchasing a tire changer (regardless of type or brand) is a good way to save money (in your garage) and make money (in your shop). The reason being, how much are people paying to get their tires mounted/dismounted? If the answer is anywhere between $75-$150 for all 4 tires then you shouldn’t think too hard as to why you should spend between $1500-$2500 on a tire changer. Truth be told, if the tire changer is for your home, in a matter of months you will have it more than paid for and just weeks if it is for your shop. JMC carries over 50 different types of tire changers from a wide array of companies such as CEMB, Dannmar, Corghi, Hofmann, Ranger and Tuxedo you can be sure that variety is something you will get when you look into us for all of your tire changing needs. JMC offers the best quality products at the most affordable prices. Contact JMC today to learn more.